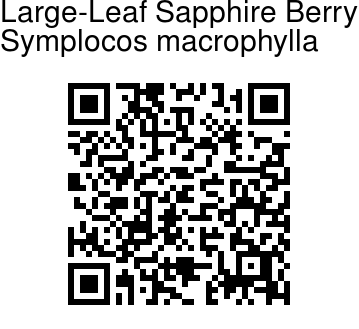 Large-Leaf Sapphire Berry is a tree up to 7 m tall, with young branches curved, rusty woolly. Leaves are simple, alternate, estipulate; leaf-stalk 10 -20 mm, stout, woolly; blade 7.5 -15 x 3.5 -7.5 cm, elliptic , elliptic-ovate, base pointed or rounded, tip pointed to tapering, margin crenulate, recurved when old, hairless above, rusty hairy beneath, leathery, yellow when dry; lateral nerves 10 -12 pairs, prominent, pinnate, hairy, midrib raised beneath; intercostae netveined, prominent. 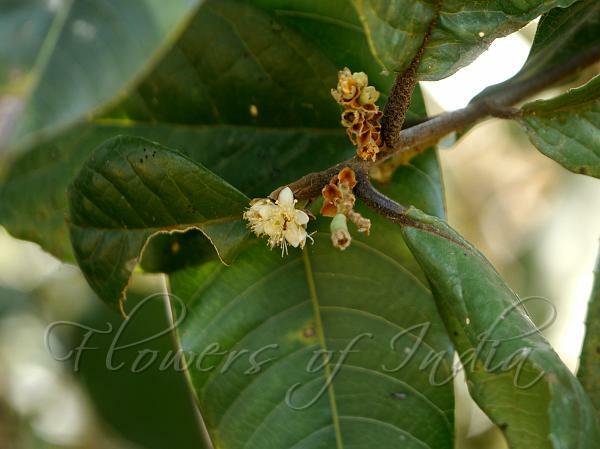 Flowers are bisexual, white, 0.85 cm across, stalkless, in leaf-axils spike, 5 cm, densely rusty hairy; bracts small; calyx tube adnate to the ovary, lobes 5, ovate, pointed hairy; petals 5 , shortly fused at base ; stamens numerous, many seriate, adnate to the flower tube; anthers short; ovary inferior, carpels 3, ovules 2 in each cells, drooping; stigma slightly lobed. Fruit a drupe, 1.2cm long, cylindrical densely hairy, purple. Large-Leaf Sapphire Berry is endemic to Southern Western Ghats. Flowering: February-April. Identification credit: Navendu Pagé Photographed in Madikeri, Karnataka.